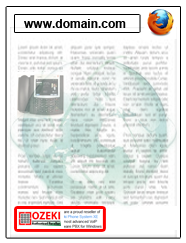 Ozeki reseller partners are required to display the Ozeki partner statement on the front page of their website. 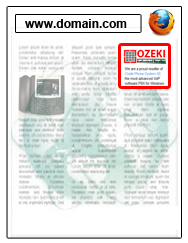 The Ozeki partner statement consists of the ozeki partner logo image and the text stating that the partner is a reseller. By displaying the Ozeki Partner statement, Ozeki Phone System XE resellers become eligible for discounts, and they may take various other advantages, such as training, participation in events organised by Ozeki and more. Download the ozeki partner logo by clicking on the following link and save it into the www root folder on your webserver. Add the following HTML code to the source code of your webpage. Check your website to make sure the Ozeki partner statement is displayed properly. It can be displayed in horizontal or vertical alignment at a position that fits the website layout. The partner statement is often placed in the right hand column or at the bottom of the webpage as shown on the following pictures.